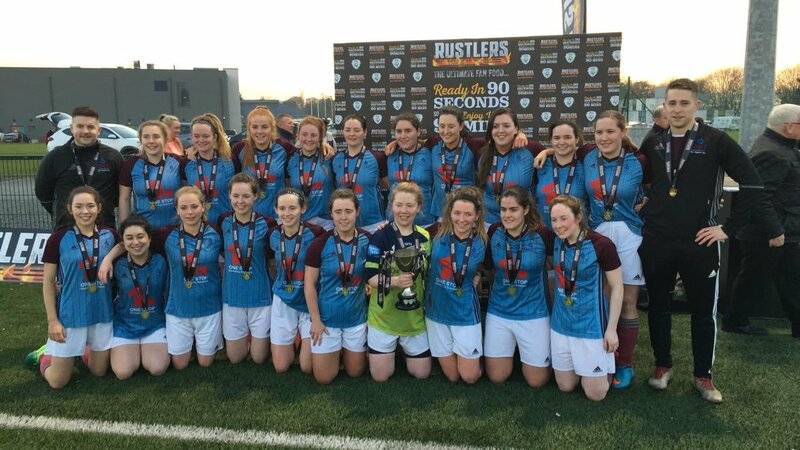 The Galway side claimed the Rustlers Women's Division One title, their first ever league success, and promotion to the top level of Colleges and Universities football with a clear cut 3-0 win over Trinity College Dublin at the FAI NTC Abbotstown. The Corribsiders were two goals ahead at the break after a first half they had mostly dominated and a third goal with just over 20 minutes of the game remaining sealed a famous win for Sam O'Neill's side. Ciara Fogarty might have had GMIT well ahead early on but both of her efforts failed to beat Nicole Hanley in the Trinity goal. While a clever turn and shot by Emily Doyle from inside the box flew over the bar. At the other end a fine run by Aoife Robinson ended with the centre forward putting her powerful finish well over. Anita Doherty finally broke the deadlock on 25 minutes to put GMIT in front after taking a Colette Collins through pass in her stride and shooting low past Hanley. Centre back Caroline Garcia stretched the Galway lead ten minutes later when she got a touch on to Ciara Fogarty's well delivered corner and forced the ball over the line from close in. To their credit Trinity responded and might have got back on level terms before the interval. First Ali Flaherty fired a free from the left past the post then Robinson was unlucky to see a hooked shot deflected out and Tara Coleman then headed over from the corner. Substitute Lauren Keane grabbed the third GMIT goal midway through the second half following a great move involving Doherty and Player of the Match Fogarty to leave the Galway side well in control and they were in little danger of allowing Trinity to stage any sort of comeback. TRINITY COLLEGE DUBLIN: Nicola Hanley; Madison Casey (Claire Nolan 65), Emma Gallagher, Cliodhna Ni She, Amy Ewing; Niamh Kane, Frances Smith; Tara Coleman (Tini Schelling 55), Ali Flaherty (Charli Ann Lynch 74), Deirdre Byrne (Aine Tucker 80); Aoife Robinson. GMIT GALWAY: Sorcha Murphy; Carmel Heeney, Denise Starr, Caroline Garcia, Bronagh O'Rourke (Cliohdna Fitzmaurice 87); Aoife Jones (Emma Connolly 84), Emily Doyle, Colette Collins, Avril Dalton (Lauren Keane 53); Anita Doherty, Ciara Fogarty (Sarah Harding 81). Referee: Paul Tuite Assistants: John McCarthy, Derek Rooney.